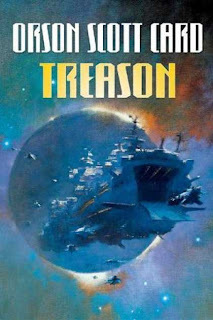 "A Plantet Called Treason" was one of the first books by Orson Scott Card, and he later went back and edited it and published it again under the title, "Treason." I read this book as a teenager, before I knew who Orson Scott Card was. Every now and then as an adult I would try and remember the title of the this weird book about a planet where scientists were abandoned to pursue their area of expertise with their families, all of whom separated into clans, and bred/developed their knowledge till the genetecist could heal like Wolverine, the geologist could mold and shape stone, the demagogue could create the illusion of themselves as other people, the physicist could control the rate of travel through time around themselves. This is the background to the book. A few months ago it came back to mind, and I rediscovered the name and author of the book, so I decided to get it. There is some sensuality in the book, though not explicitly sexual - more than I would like my 11-year old son to be exposed to, so I would suggest a strong PG-13 rating as a book. The audio production is fine - one of the people who reads the Ender and Bean saga reads the whole book, as it's told from first-person perspective. All in all, a pleasant, intersting book. I'll give it 7 out of 10.